Childhood memories are a form of time travel. They can take you back to the time and place and person you once were. I grew up going to Old Sturbridge Village, a living history museum in Massachusetts. I have such happy memories of my visits there as a child. Of the sun beating down on us as we walked the dirt roads, scuffing our feet and watching the dust swirl around our toes. Of hanging over the split rail fences watching the lambs mill around their mothers. Of standing in the kitchens listening to my mom discuss cooking techniques with the costumed interpreters. Of eating fat ginger cookies from the bake house. Of lying flat on the little bridge across the stream looking for minnows. 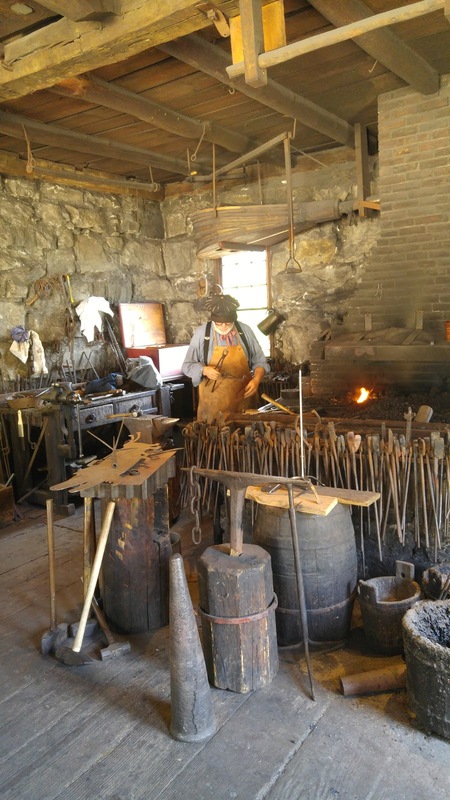 Of watching as the blacksmith pumped the bellows and listening to the ring of his hammer and then the hiss of the steam as he plunged metal into water to cool it. When I walk through the doors of Sturbridge Village I become that little girl again. I promised my daughter that if she didn't miss much school this year I would let her take a day off and we would do something fun. She picked Sturbridge Village. My children have the same happy memories associated with it that I have. My son has missed too much school to take a day off and my husband couldn't take a day either so it was just my daughter and me. I don't know which of us was more excited about the day. Our first stop was the lambs. My daughter loves animals and this is what she was most excited about. We timed our visit just right. There were a lot of lambs scattered all around the village and they were absolutely adorable. I think my daughter could have stood there all day watching them. I finally dragged her away to visit a few of the houses. The interpreters are always happy to answer questions and just make the visit interesting. One thing I appreciate about OSV is that the experience stays the same. Exhibits may change slightly but the village I take my children to visit is the same as the one I visited myself. I am always afraid that somehow, in their bid to keep up with society and in order to attract more visitors, they will do horrible things like put interactive screens in the houses. The appeal of museums like this is that they put you in the picture. When you walk through them it is possible to feel like you live in the village, that you too will be working in the garden or plowing the field or milking the cow. I am glad they don't do anything to take away from that feeling of immediacy. The little red farmhouse pictured at the top of this post was always my favorite place in the village. I used to imagine living in it with the fields all around me and the stream down the hill. The kitchen is always in use and I love seeing the food they make and the recipe books they use to do so. The interpreters are very knowledgeable and always happy to talk. We also had to make a stop at the blacksmith's shop. This was always my son's favorite. He would sit and watch the blacksmith at work and chat to him for as long as we would let him. When he found out we were going to OSV he made me promise we would all go back over the summer so he could visit the blacksmith. My son is at a technical high school and is taking machine shop. I wonder if his fascination with working with metal started when he was little and had to be dragged out of the blacksmith's shop. Sturbridge Village is quintessential old New England. The buildings are original and have been moved on location and restored to their former condition. The scenery is picture perfect. There are a lot of paths and trails you can walk. It is not just the childhood memories that are a form of time travel, Old Sturbridge Village is as well. It takes you back to a slower, quieter time. A time with its own problems and its own struggles but also its own joy and its own beauty. One important part of any visit to OSV is a walk down the hill to the stream. It is vital that you sit on the little bridge, listen to the blackbirds and swifts in the meadow, and then play a few games of Pooh sticks. My childhood and my children's become merged at Sturbridge Village. Is is me or my daughter agonizing about which flavor of candy stick to buy? Is it me or my son sitting on the fence watching the cattle? Sometimes I feel that if I could just turn my head quickly enough I would see her, that little girl I used to be, ponytails flapping as I run, red sneakers covered with dust, headed for the stream or the farm or the covered bridge. But now I turn my head and see another little girl, with a braid bouncing on her back and grey converse covered with dust, headed for the stream. She grins at me and starts collecting sticks. She is determined to win at Pooh sticks. I grin back and start collecting them too. For a moment, I can almost feel the swish of my ponytails as I turn my head. What a beautiful post - such wonderful memories! I lived in Massachusetts for a couple of years while I was in grad school, and I visited Old Sturbridge Village several times. This post makes me want to go back! Oh, where in Mass. did you live? OSV is such a happy place for me. I'm glad you like it too. Oh, I wish I could travel more to the East Coast. Perhaps I should rethink my future grad school destinations. What an absolutely lovely thing to say! Thank you. The best Tintin comics, in my opinion, are the ones with extended plots that span double volumes, instead of one. I swear I'm not trying to make you spend more money -- the double volumes are just more exciting. Perhaps because Tintin and his cohorts get to even more exotic locales. Perhaps because mysteries are best left keeping readers guessing for 124 pages rather than 62. The first double volume adventure is The Secret of the Unicorn and Red Rackham's Treasure. Also widely thought to be the best place to start when it comes to Tintin. The opening mystery is intriguing. Both volumes are basically treasure hunts on an international scale. Oh, and it doesn't get more swashbuckling than this! The story goes back to the past to talk about some pirate lore. The most exciting adventures, in my opnion, is the second double volume: The Seven Crystal Balls and Prisoners of the Sun. Again, the opening mystery is great. There's a curse on seven archaeologists who found a South American mummy and Tintin is here to find the cure! The stakes get higher to the point Tintin and Captain Haddock themselves have to travel to South America. Where they get arrested! So you can see why I find The Seven Crystal Balls and Prisoners of the Sun so exciting. If we're speaking strictly adventure, I think these two are the best. But my personal favorite is the final duo: Destination Moon and Explorers on the Moon, where Tintin explores space! And lands on the moon years before Armstrong and Aldrin actually did! The humor in both comics are so memorable I can rattle off nearly all the slapstick and funny dialogue. But Herge's work just becomes more and more sophisticated as he churned out more Tintins. There are moments of beautiful and tragic and ambiguous human drama in Explorers on the Moon. There's a clear reference to suicide, so keep that in mind if your daughter is too young. The suicide doesn't happen on panel, but it's more than an allusion. I hope this helped a bit, Jennifer! For a beginner, I think The Secret of the Unicorn and Red Rackham's Treasure are great. Herge gets better and better later on, but I think this first duo are just great first bases to start with. It is so nice of you to give such detailed recommendations. I think I will start with Red Rackham's Treasure. My daughter will think it is fun and I'll read it too. If she likes it I will move on to the moon ones. Then I will know what people are talking about when they mention Tintin! The Secret of the Unicorn is the first comic book in the duo adventure. Red Rackham's Treasure came after. I'm sure you understood perfectly what I meant but I just wanted to be sure you didn't get Red Rackham's Treasure first because then you would be a bit lost. I do hope you enjoy Tintin. I think because of his early, crude, and racist comics, people have the perception that all the Tintins are like that when he gets better and more enlightened with time. I'd even say that some later Tintins are sophisticated enough to be considered literature. Your comment was perfectly clear, I just wasn't! I would have double checked before I ordered anything though. It is. We always enjoy going there. It is so scenic and relaxing.